Fisker’s electric SUV will cost less than $40,000 but offer a better range than the entry-level Tesla Model Y. Following last week’s blurry teaser, Henrik Fisker has revealed the first image and details of his company’s new affordable electric SUV on social media, just a few days after the world debut of the Tesla Model Y. As expected, Fisker's new model is a compact electric SUV that will rival the Model Y. While the company’s first electric SUV still doesn’t have a name, Fisker says the standard model will have an 80kWh battery that will deliver around 300 miles of range when fully charged. Performance details haven’t been revealed, but two electric motors will provide all-wheel drive, with a motor on each axle. 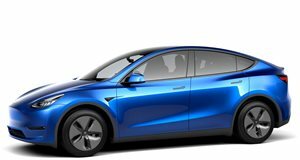 Like the Model Y, the base version of Fisker’s electric SUV will cost less than $40,000, but the cheapest Standard Range Model Y will only deliver between 220 and 230 miles of range. The Long Range model, on the other hand, increases the range up to an impressive 300 miles with a starting price of $42,700. Fisker says the unnamed electric SUV will feature "captivating design touches that have been traditionally reserved for supercars in the past.” The first released photo confirms it will have a large front-mounted radar instead of a traditional grille, a large front air intake, flared wheel arches and futuristic headlights. Other notable design features include a targa-style removable roof that "with the touch of a button, an extended open-air atmosphere will be made possible without compromising the rugged and safe structural integrity of an SUV.” Inside, the interior will offer class-leading space and feature a large head-up display and an intelligent user interface. Production will take place in the US, but the location hasn’t been confirmed yet. Prototype testing of Fisker’s electric SUV is said to begin by the end of this year before the production model goes on sale in the second half of 2021. Fisker also revealed the eMotion last year with 780 hp, a 400-mile range, and a $100,000+ price tag, but the electric sedan has been delayed to give the company more time to develop the required battery technology.